Buy 5 x Buckets @ only £18.50 each. Buy 10 x Buckets @ only £18.00 each. LIFELINE Lamb & Ewe is the only purpose formulated supplement that benefits the unborn lamb as well as the ewe, which is proven by SAC (Scottish Agricultural College). Trials at SAC showed a 25% increase in IgG levels in ewe colostrum. IgG is the antibody that infers natural passive immunity from the ewe to her lambs. Ewes: Offer ad lib, free-access 1 bucket (22.5kg) per 30 ewes. Quality colostrum quality and yield due to multiple energy sources ensuring the efficient absorption of nutrients and enhanced protein levels. 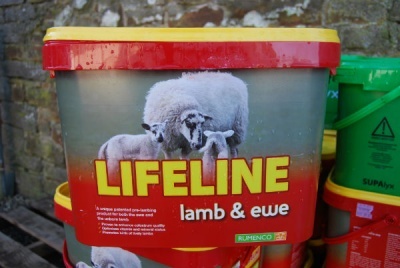 Lifeline increases antibody levels and absorption of colostrum by the lamb therefore maximising immune status, enabling the new born to fight disease.Easier lambing's/improved lamb vitality: high levels of selenium and Vitamin E help ensure the lamb gets the best possible start as well as minimising lambing problems.